Earth’s poles have historically been some of the most poorly mapped regions on the planet. With heightened awareness, and an overall sense of urgency around global climate change, there is a need for high quality mapping data to facilitate a deeper understanding of the impact with regard to Earth’s polar regions. Sparked by President Obama’s 2015 Executive Order, and thanks to the University of Minnesota’s Polar Geospatial Center (PGC), along with their partners and sponsors, we now have high resolution topographic models of the Arctic region and the entire continent of Antarctica. From monitoring and modeling the impacts of climate change over time, to field logistics, scientists, government officials, and the broader user community can leverage these great elevation maps and layers via the ArcGIS Living Atlas of the World. ArcticDEM is a National Geospatial-Intelligence Agency (NGA) and National Science Foundation (NSF) public-private initiative to automatically produce a high-resolution, high-quality Digital Surface Model (DSM) of the Arctic using optical stereo imagery from DigitalGlobe. Esri has been providing this data to users since 2016. However, we recently updated to ArcticDEM Release 7, which includes 2-meter resolution elevation data for the entire region. All of our online Arctic DEM layers and maps can be accessed and used in ArcGIS Pro, ArcMap, and custom web apps. Want to see ice field and glacier changes over time? For a quick introduction to the different layers and functionality, check out the Exploring Arctic Elevation user guide. This story map will provide a quick overview of the different renderings and functionality, and even demonstrate how to analyze and measure ice changes over time. It is an eye opening experience, I encourage you to give it try. Also, since the Arctic DEM layers themselves are time enabled, change over time, and much more, can also be accomplished using ArcGIS Pro. 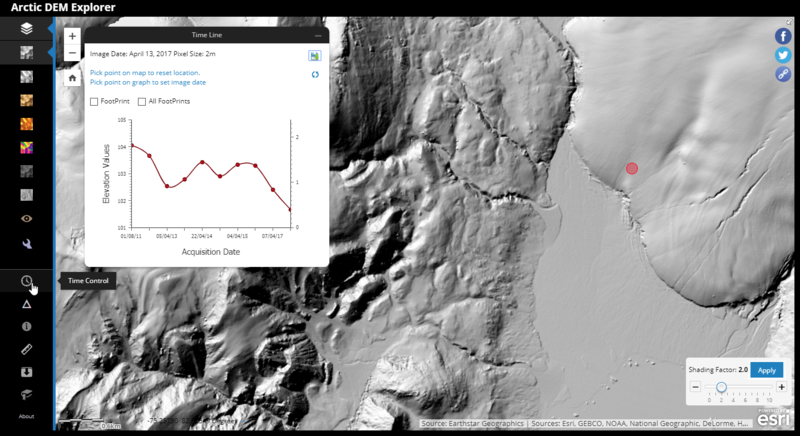 Arctic DEM Explorer app showing Hillshade Grey and a profile from the Time Control. Click here begin exploring. New to the Living Atlas is an 8-meter resolution elevation model covering the continent of Antarctica. The Reference Elevation Model of Antarctica (REMA) is the latest addition to Esri’s polar elevation services, adding a level of detail not previously available in a full coverage map of Antarctica. According to Ian Howat, director of the Byrd Polar and Climate Research Center at The Ohio State University, “Up until now, we’ve had a better map of Mars than we’ve had of the Earth.” I think it is safe to say that a gap has been filled. Funded by the National Science Foundation’s Division of Polar Programs, REMA Release 1 is an 8-meter Digital Surface Model (DSM) constructed from sub-meter, stereoscopic satellite imagery collected by DigitalGlobe’s Worldview satellite constellation. The DigitalGlobe satellite imagery is licensed by the National Geospatial-Intelligence Agency, and includes data acquired between 2009 and 2017, with most collected in 2015 and 2016. This elevation data is ready to use in a number of different web map views and renderings. Some layers are optimized for visualization and some for computation. For more details, refer to this item description or click on the image below to begin exploring with the Antarctic REMA Explorer. 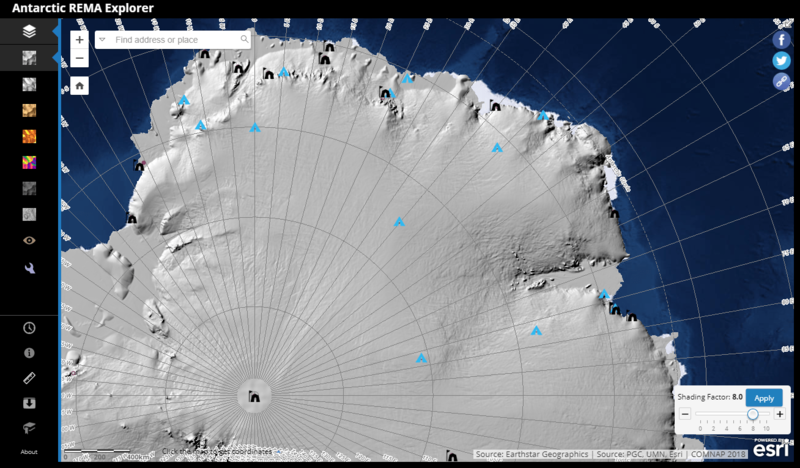 While our Antarctic layers are not currently time enabled, users can find and download individual strips from different points in time by going to the ‘REMA Strips’ section of the PGC website. Arctic REMA Explorer app with the elevation rendered as a grey hillshade. Click here to begin exploring. In case you missed it above, all of the Arctic and Antarctic DEM layers and maps can be found in the ArcGIS Living Atlas. New to ArcGIS? Sign-up for a free Online account to access additional online content, start making web maps, and start collaborating today. For a full ArcGIS experience, sign-up for a free trial. How many millionaires are living in your town? It’s no surprise that today’s residential real estate has remained pricey. Rising interest rates aside, the value of most homes has gradually recovered since the last major price correction a decade ago. Gone are the days of unrestrained, unsound lending practices, and borrowers overextending themselves to the point of default or foreclosure. By and large, property values across the price spectrum have appreciated since the last recession. As this trend continues to be prevalent within markets containing premium-priced properties, we’re faced with a growing number of towns with million-dollar homes. But how many? 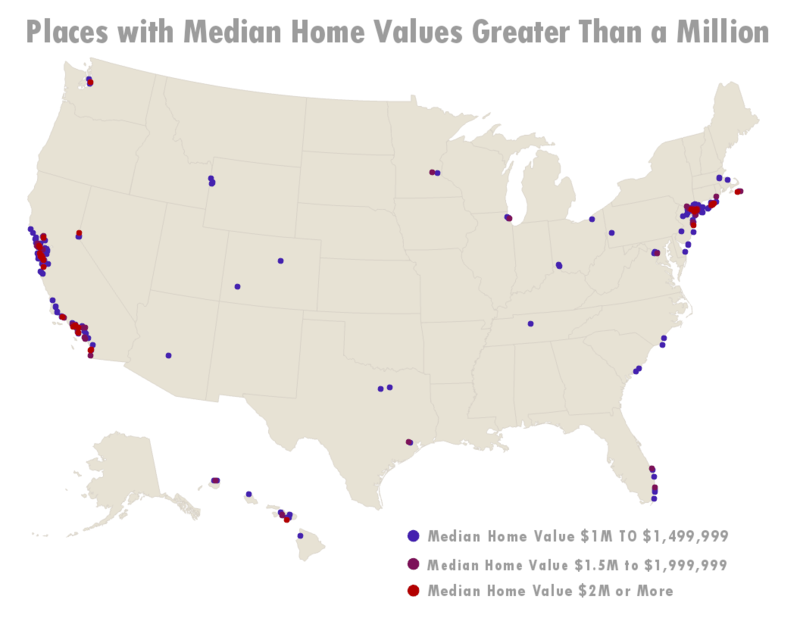 More than 2.1 million homes are valued between $1 million and $2 million. Nearly 600,000 homes are valued at $2 million or more! New York City tops the list with more than 68,000 homes valued at $2 million or more! These numbers sound impressive, but million dollar plus homes represent a relatively small segment of the US housing stock. However — an interesting data discovery here is that the percentage of million-dollar properties has more than doubled since 2010. Across the US, you can see that majority of these million-dollar plus cities are concentrated along the east and west coast regions of the US. Esri provides demographic data for 137 countries covering 90% of the world’s population. Esri’s in-house US Data Development team, which consists of demographers, economists, analysts, and programmers, develop independent demographic and socioeconomic updates and forecasts for the United States. In addition to processing US Census and ACS data, the US Demographic Data Development team produces unique and innovative databases such as Tapestry Segmentation, Consumer Spending, and Market Potential which have become industry benchmarks for understanding communities. To learn more about Esri’s data accuracy, view www.esri.com/accuracy. Why track the multi-million dollar housing market? In most cases across the country, housing affordability continues to be a major concern. As a result, Esri’s US demographics team recognized the importance of adding more detail to the home value distribution. “In many markets home values have surpassed their pre-recession highs. As more homes breach the million-dollar valuation mark, our home value distribution has been expanded to reflect current prices,” says Esri Chief Demographer, Kyle R. Cassal. A picture is worth… well, one or two million bucks! One of the best ways to show you the impact of these new data ranges is with a map. Esri’s US demographics team created the 2017-2018 Home Value Comparison web map for the Manhattan, New York area using ArcGIS ’s smart mapping technique called Predominance Mapping. The panel on the left displays the predominant home value range from Esri’s 2017 home value distribution by Census tract. The top end of this distribution of owner occupied housing units is capped at $1 million or more and symbolized by the deepest purple bubbles. The panel on the right displays Esri’s newest 2018 distribution utilizing the three new top end home value ranges. The deep red bubbles symbolize the new higher top-coded home value range. Using the predominant mapping technique, you immediately see the impact of the new intervals. Look at how the finer resolution ranges distinguish the smaller pockets of the highest valued homes at $2 million and beyond. So, what does your town look like? Access Esri Home Value data from these products and find out! Living Atlas of the World—Access ready-to-use maps. For more information about US demographics click here. Through the Community Maps Program organizations contribute their local geographic content which is published and freely-hosted by Esri. Everything from basemap layers such as address data, parks and trees, to imagery and stream gauge data can be contributed. Our users have just provided new and updated basemap layers and high-resolution imagery for 37 communities in Canada, Japan, Switzerland, and the United States. The Community Maps Team has published over 200 projects this year alone, and we’re not done! More and more communities are discovering that the ArcGIS platform is the best place to freely host their organization’s basemap content. This latest release includes building footprints, facility sites, local parks, sidewalks, trees and other great content supporting campuses, cities, and counties across the globe. 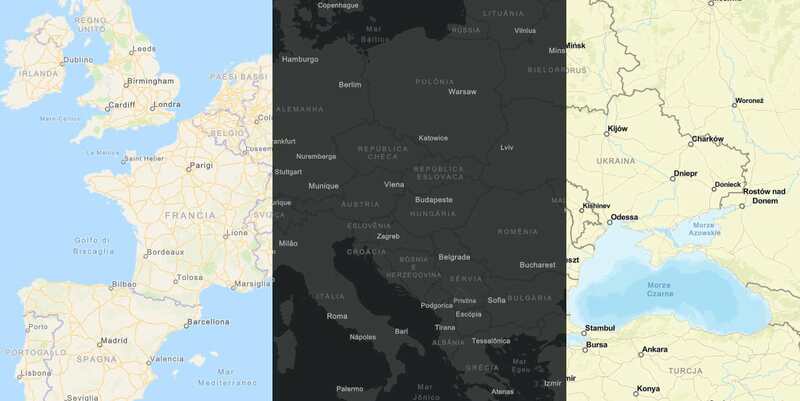 Detailed large-scale basemap layers and high-resolution imagery shared to the ArcGIS Living Atlas of the World are what set basemaps in ArcGIS apart from other mapping APIs. Do these contributions make a difference? Just have a look at these examples by selecting the images below. City of Vernon, British Columbia, Canada (Neighborhoods, Points of Interest, Waterbody, Road Centerline, Owner Parcels, Building Footprints, Airports, Local Parks, State Forests/Parks, Trails, Landscape Area & Street Pavement). This release also includes high resolution imagery for an impressive 270 campus-areas throughout the state of Hawaii, shared by Resource Mapping Hawai’i, one of our latest Community Maps contributors, and the leading provider of aerial mapping, remote sensing and GIS solutions in Hawai’i and the Pacific region. The sub-meter resolution (0.03m) is remarkable. Click on the Story Map below to view interactive maps of our new communities. It’s easy! The Community Maps Program works with authoritative GIS data contributors to build the ArcGIS Living Atlas of the World consisting of reference and thematic maps covering a wide variety of topics. Community Maps Program contributors participate by sharing data to one or more of these communities. You can begin contributing by registering here! Shane is a Cartographic Specialist for Esri's ArcGIS Content Team. He curates and recruits content for the ArcGIS Living Atlas of the World through Esri's Community Maps Program, and explores and implements new and innovative delivery methods of providing geospatial information. With our latest release late last week, Esri Vector Basemaps updated map styles and added features, increased the number of localized maps, and published a new creative style. We added new HERE data to improve the maps. Our Community Maps Program also provided new data. See these blogs by Shane Matthews for specific contributions. Display of features improved across several basemaps. Street Map, Streets with Relief, and the Hybrid Reference Overlay changes increased city font size, added beach sprite, and made JSON layer names more user friendly. New pavement markings enhance larger scales, especially at the campus level. The updated Topographic vector map displays arrows and handicapped parking symbols. This Reference Document provides information on recent changes and structure of our basemaps. Bookmark this group or search the Living Atlas of the World (Basemaps category and Vector Tiles sub-category). Similarly, Esri vector maps are accessible in the ArcGIS.com map viewer and ArcGIS Pro in the same Living Atlas Basemaps category and Vector Tiles sub-category search. We added three new languages to our collection of localized basemaps. Our current total is nine different languages. Each one is available in nine different basemap styles. New are Italian, Polish, and Brazilian Portuguese. These join previously released Modern Chinese, French, German, Japanese, Russian, and Spanish. To make localized maps the default basemap, change the organization’s Region and Language in the General settings. Also, change the Map setting to display Esri vector basemaps for the Gallery. Each language above is linked to a group of web maps. Localized labels display primarily at small scales; however, we are expanding translations across more feature classes and at more scales. Additional languages will be deployed in subsequent releases. Quick Edit is only configured for Esri vector basemaps. This quick path sorts map features into six high-level categories. Apply random colors for cartographic inspiration, or apply a pre-defined color palette to each category. Edit Layer Styles works with Esri vector maps and your own styles. It offers more control over each map feature’s spec. Countless options are available to customize your new vector map. 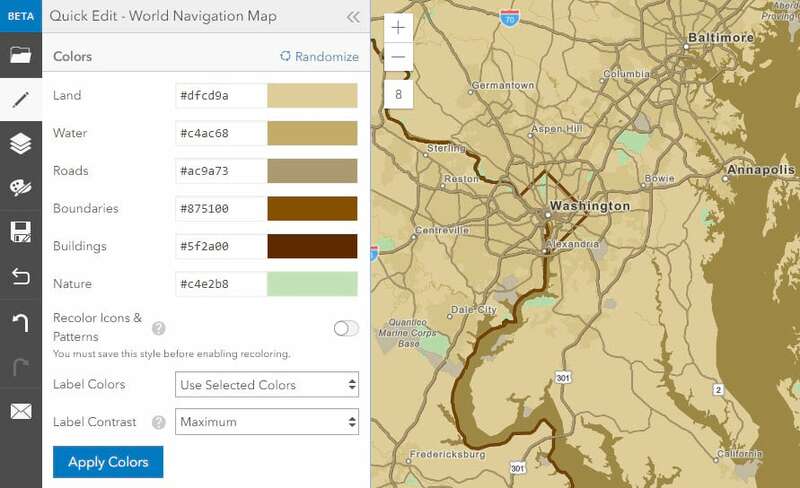 Save your new style as a tile layer in your ArcGIS.com account and use the new style in your web maps and apps. This blog and space on GeoNet offers information about the Style Editor. This recent Esri Webinar showcased the Style Editor. Follow-up questions and answers are at this Living Atlas GeoNet page. And now, something completely new! Pop Art is Esri cartographer Andrew Skinner’s new custom style. This 1960’s-inspired map is busy, brash, and bright! This map, along with other Esri Creative Maps, pushes the limits of map design. The maps have drastically different looks, but still use the same vector map content. He also published a series of blogs on working with and customizing Esri Vector Basemaps. Check them out! Have you ever seen a problem with Esri Vector Basemap data that needs to be fixed? Report issues directly on this Feedback Map. Our team reviews your comments and considers the update for one of our frequent releases. Andy is the Project Manager for the Basemaps in the ArcGIS Living Atlas of the World. Creating and updating the basemaps is a collaboration of the Community Maps, Data, Authoring, QA, Release, and Development teams.